Buy this item and earn 113 ClubPoints. Create a powerful visual experience with the ability to switch between two 4K video sources seamlessly. 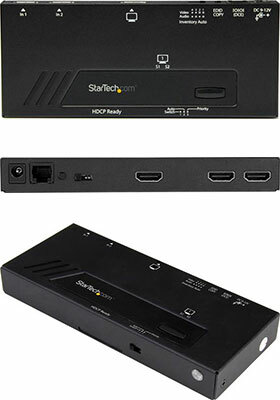 This 2-port HDMI® switch lets you share a monitor, projector or TV with two different HDMI enabled video sources, and switch between them with minimal disruption. The video switch maintains 4K Ultra-HD picture quality while switching between content from HDMI source devices - including Blu-ray™ players or DVD players, computer systems, video game consoles, digital cable and satellite boxes and A/V receivers. • Fast auto-switching: ensures minimal time for switching between HDMI sources. The switch provides effortless operation with advanced auto-sensing - it detects the latest connected HDMI source and automatically switches to it. Auto-switching encourages collaboration among colleagues, by making it easy to share your projector. It also ensures no downtime in a digital signage application if a source signal is accidentally powered off or fails. • Priority switching: identifies one port to take first priority for HDMI sources when multiple sources are connected, ideal for applications such as digital signage. • Manual switching: enables you to manually select your HDMI source with front-panel buttons that are easy to use.